We usually start picking around late August. That's when the Ginger Golds come in. 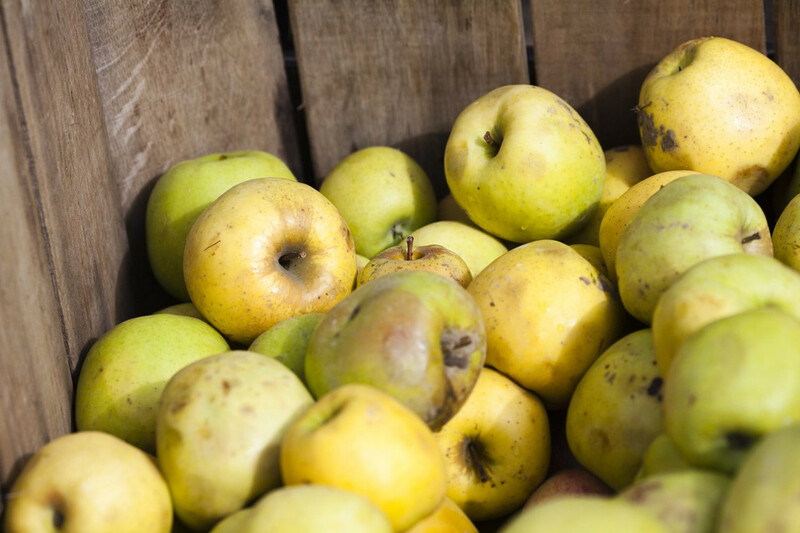 Then, throughout September, the Honey Crisp and Jonagolds are ready, and we can usually pick a few bushels of Fujis, Braeburns, Mutsus and Staymans in October. We've been going out to the orchards to pick our own apples for years. And I suppose I'm pretty spoiled, because I can barely stomach apples from the grocery store these days. Although I will give some credit to Whole Foods (NASDAQ: WFM), which does actually come through if the local season peters out faster than normal. But the fact is, once you've eaten fresh, sustainably-produced apples – picking them while they're in season – it's hard to go back to slumming it in the produce aisle. Sure, most grocery stores display the shiny, perfectly-shaped Red Delicious and Granny Smiths throughout the year. But looks can be deceiving. While most consumers run to grab the most aesthetically-pleasing apples, they're unlikely to know the true joy that comes with visual imperfections. The apples we pick don't look like the apples you find at the grocery store. Most are oddly-shaped, speckled with insect nibbles and visible scars and blemishes. None of these would ever get passed a grocery store buyer, yet the flavor and nutritional value of these apples is superior to anything offered at the food store. Of course, even the orchards that source most grocery stores don't exclusively produce “perfect visual specimens.” And in many cases, the apples that don't meet the prerequisite for observable perfection are often wasted or used in a capacity that devalues the product, leaving the farmer with produce that can't command a decent price. In some states, groups of volunteers often show up to the orchards at the end of the season, scoop up all the “unwanteds,” and deliver them to food banks. Certainly this is an honorable endeavor. But by the time this happens, the shelf-life of these apples is extremely limited. However, thanks to a wonderful free-market idea, “ugly” fruits and vegetables are finally finding a proper home. We waste 40 percent of our food, and the National Resources Defense Council reports that 20 percent of produce is wasted at the farm. Fruit and vegetables that don’t meet strict supermarket standards for size and appearance usually go to waste. Or, if the value of a crop suddenly drops and it costs more for the farmer to harvest it than to sell it, it rots in the field. Palo Alto’s Bon Appetit Management Co. has now started a program that could make a dent on some of this waste on the farm, since it feeds vast numbers of people at the corporate, university and museum cafeterias it runs across the country, including at Google locations. Called Imperfectly Delicious Produce, the program connects with produce aggregators and farmers to bring items like just-barely scarred apples and broccoli fines (loose broccoli florets) into Bon Appetit kitchens. Since launching in May, Bon Appetit’s Northern and Southern California sites have purchased 35,000 pounds of produce that might have otherwise been thrown out. Eliminating food waste while honoring free market principles – without the assistance, demands or objections from government. It'll be interesting to see if this idea catches on. But if the economics work (which I'm sure they do), I can easily see a lot of higher-end restaurants utilizing this model to provide quality ingredients while improving margins. As for us, when apple-picking season starts again this year, we'll be out in full force. Because there are few things more enjoyable in the fall than picking apples with your family, then heading back to the house to eat them and can, and dehydrate them for the coming winter. Oh, and of course it's a necessity to bang out a few apple pies, too. They don't last long, but there's definitely something magical about a warm piece of homemade apple pie on a chilly fall evening. I prefer mine with a bit of cinnamon and a glass of fresh, raw milk. No haggis for you! It's been outlawed for your protection.